The pan coater is one of the most used machinery for manual pelleting. The big novelty of the pan coater is a special segmented pan for an optimal material mixing process without extra manual/hand work. With our segmented pan there is no need of mixing by handbecause of the edges the seed mixes itself. In combination with our standard delivered liquid spraying nozzle and optional pump a homogeneous liquid spraying is realized. Adding a PFR-60 powder feeder, which gives a very homogeneous powder output, like a powder curtain, you have the best machine for your manual pelleting process. An other big advantage of the pan coater is the dust extraction at the back. This means that the operator is not in contact with the dust coming of the process. But before it reaches the operator it is exhausted at the back of the pan. This means a better view on the process and less dust into the room. 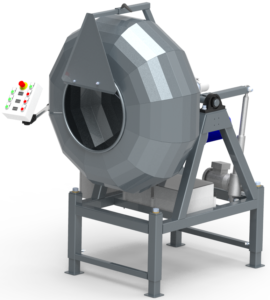 Every pan coater is delivered with a halogen light which gives an optimal view during the pelleting process. With the standard control box you can start/stop and change the speed of the pan, the liquid pump and the optional connectable powder feeder. On request it is possible to supply an electrical angle changing system for the pan.